Now super dark color is only 20 minutes away! 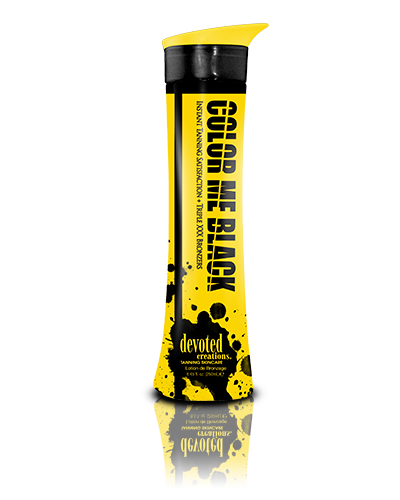 Color Me Black™’s intoxicatingly addictive fragrance and lush triple dark bronzers make this tanning elixir a vacation in a bottle. Blended with camu camu berries to help slow down the aging process, Color Me Black™ utilizes seaweed and bee’s wax to help draw toxins from the body and work to condition the skin. You will notice soft, smooth skin, instant color and a lasting dark tan. Camu Camu Berries – complement the body's natural growth and repair of tissues & collagen formation. Intense DHA formula blended with natural and cosmetic bronzers for super dark immediate and delayed bronzing results.